SMG's listed new media subsidiary aims to achieve the goal by adopting new technologies and teaming up with Foxconn and Huawei. Oriental Pearl Group, SMG’s listed new media subsidiary, said on Monday it aims to boost the number of middle-class viewers in China to 300 million by adopting new technologies and teaming up with partners like Foxconn and Huawei. The company intends to expand from a new media firm to four business segments of Internet media, digital entertainment, TV shopping and culture consumption. The segments will embrace 18 industries including video, game, new media, shopping and tourism, and it hopes to eventually cover 300 million middle-class people in China. Oriental Pearl will adopt cloud and artificial intelligence technologies as well as invest in IT infrastructure to help it to achieve the target. The biggest listed arm among state-owned media now has more than 160 million users. The company and subsidiary BesTV — the country’s biggest IPTV operator — also announced several partnerships on Monday. The partners include Foxconn, Huawei, New Oriental Education & Technology, JD.com and other firms engaged in super high-definition content, next-generation communications, online education services and eSport. Foxconn and BesTV, members of a new “5G Plus 8K” alliance, will develop high-speed 5G and super high-definition video up to 8K technology touted as the highest ultra high definition in digital television and digital cinematography. 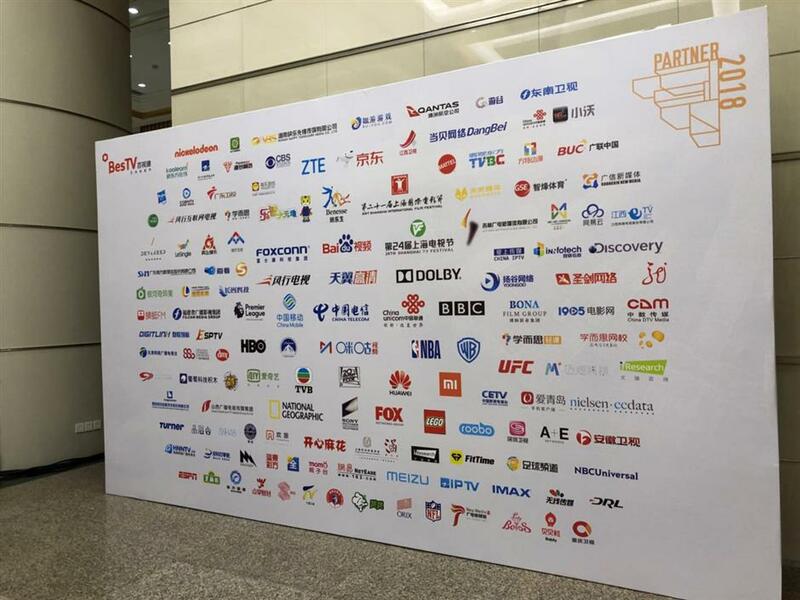 BesTV unveils its new and existing partners in Shanghai.